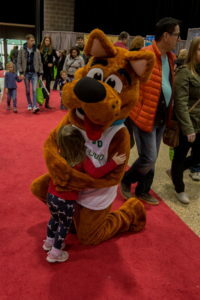 Scoopy Doo Canine Waste Removal Inc, official clean up crew of the Winnipeg Pet Show & Doggy Potty! Scoopy Doo Canine Waste Removal Inc. is a locally owned pet waste removal service that has provided Winnipeg pet owners with reliable cleanup services of pet wastes at affordable prices for almost 20 years. At Scoopy Doo, we care about the environment of your pet, your family and your neighbourhood. The frequency of visits is based on each customer’s specific needs, whether it is weekly, a one-time cleanup, or just the big spring cleanup when the snow melts, revealing a winter’s worth of mess. Cat litter box cleaning is also a popular service we offer. Our firm professionally handles one of life’s more unpleasant tasks! Snow, rain, heat, mosquitoes, winter, spring, fall, summer, whatever the weather, we pick up where your dog left off. Click here for more info about Scoopy Doo Canine Waste Removal! Doggy Potty real grass sod courtesy of Blue Grass Sod Producers Ltd! Golf Courses and Groundskeepers. We are a 3rd Generation family owned and operated sod farm committed to producing the best Certified Nursery Sod in Manitoba. Over the last 51 years we have earned a reputation for growing & providing top quality peat base Blue Grass sod & great customer service. Click here for more info about Blue Grass Sod Producers!